Whenever you’re cooking, whether it’s for a Jewish Holiday, a weeknight supper, or anything in between, you’re bound to find the recipe you’re looking for in one of ArtScroll’s top-of-the-line Kosher cookbooks. With Purim coming up in just a few weeks, we figured it’s a good time for the Official ArtScroll Blog to share one of those fabulous recipes: Savory Hamantashen from Fresh and Easy by Leah Schapira. Traditional sweet hamantashen are great, but these Savory Hamantaschen, with their delicious dipping sauce, make a great appetizer for your Purim Seudah! Looking for other hamantashen ideas? These crafty hamantashen from Crafting Jewish are a great mishloach manot container! Recipe from Fresh and Easy Kosher Cooking by Leah Schapira. Copyright ArtScroll/Mesorah Publications. In a medium bowl, combine honey, garlic, salt, soy sauce, and apple juice. Marinate chicken in mixture for a minimum of 30 minutes. Add the diced red pepper. Remove malawah dough from freezer to begin defrosting. When dough has slightly defrosted (approximately 10 minute after removing from freezer), use a cookie cutter to cut out 2º-inch circles. Defrost circles for an additional 5 minutes. Using a rolling pin or pressing down with your hands, roll the dough circles slightly until they are 3Ω inches wide. Place a heaping teaspoonful of chicken mixture into the center of each circle. Pinch the edges together to form a hamentash. Heat a thin layer of oil in a skillet or frying pan. Add hamentashen to pan, filled side down. Fry over medium-low heat for 10-12 minutes, flipping halfway through or until golden (the heat needs to be low enough so the chicken is cooked before the dough browns). To prepare dipping sauce, add all ingredients to a bowl and stir to combine thoroughly. 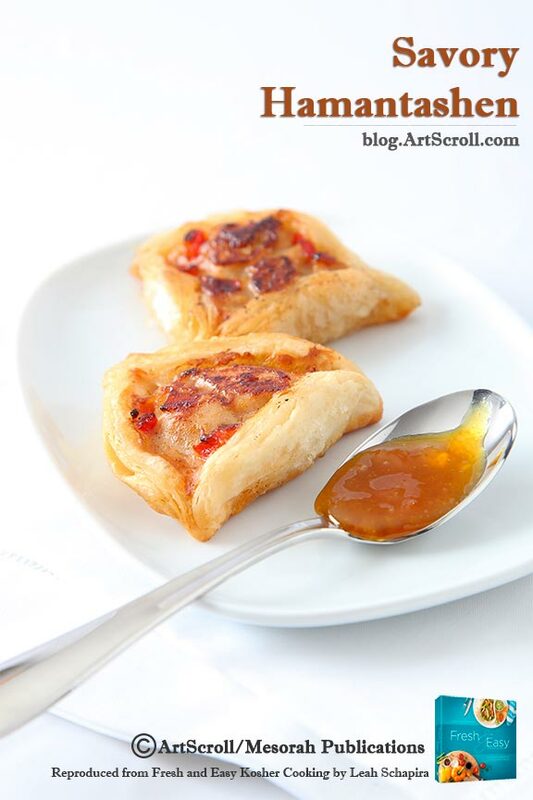 Serve hamentashen warm with dipping sauce. Click here to shop ArtScroll cookbooks.